After leaving The Star, our Dreamer next comes to 18-The Moon. In Angel Tarot, we see again Archangel Haniel. You may recall she was also in The High Priestess. You can see the two pillars in the background of both cards; these were also in the background for The High Priestess. Both The High Priestess and The Moon are intuitive and represent irrationality or the things that we cannot reason. This card is about intuition. In both cards, you can see a path marked out between the pillars. This is the path of the unknown; the path of imagination. 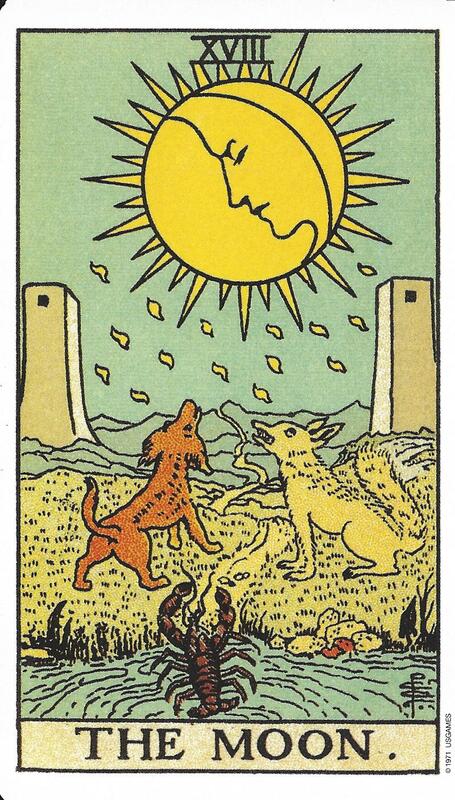 In the Rider-Waite (RW) tarot, it appears the path is being guarded by a dog and a wolf. These creatures are also in the Angel Tarot. The dog represents our rational side; the part of us that is tamer. The wolf represents the irrational or our wild side. Archangel Haniel stands between the two representing balance. The water in Angel Tarot is moving from the creeks into the large pool representing the merging of our conscious and subconscious selves. If this card is drawn it means it is time to pay more attention to intuition and dreams rather than logic. Sometimes it just feels right. We are unable to explain why we make certain choices because they are based on gut feelings. This can be difficult because our intellect wants to make sense of the choices but there is no logic to be found. We are moving into emotional territory. It may mean that there are feelings of anxiety or insecurity. Sometimes the reason for these feelings can be found in logic; other times we must go within to find the root cause so that we can release those fears. This is a time for self-care if you have not been diligently doing so. 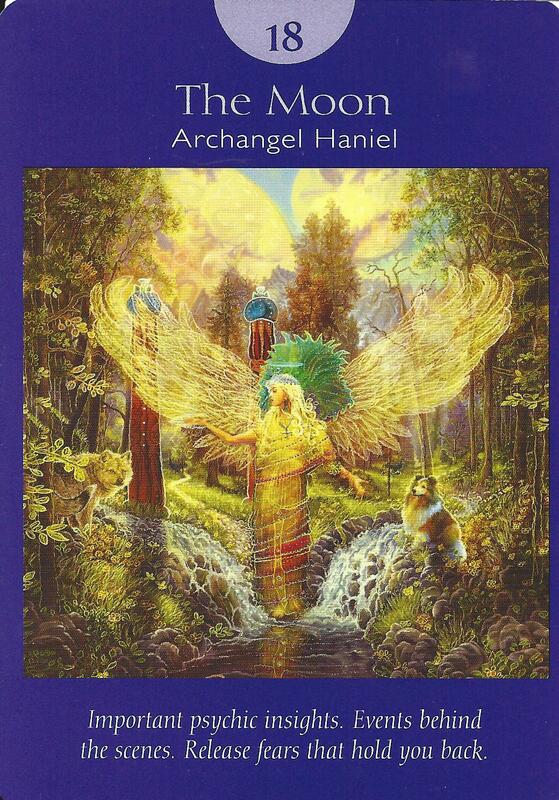 Archangel Haniel is often associated with the full moon, intuition, and clairvoyance. Thank you for publishing all of these analyses of the cards, I have found it very helpful. I’m dealing with a situation currently (a relationship situation, of course, ugh), and I pulled a set of cards from the Angel Tarot, and got a very unclear answer to what I was asking. I decided to try again and I pulled a new set of three cards, and I got The High Priestess, Balance, and The Moon. Archangel Haniel is working overtime to get me to calm down, listen to my intuition, and be patient, apparently! Very good Celisse. You clearly listened to your intuition when you pulled the first cards. If the cards seem or more appropriately “feel” confusing or unclear to you, then ask your question again and ask for more clarity before pulling cards again. It sounds like the second time, you got a clear answer. Just remember that you want to pull cards for clarity and NOT for the answer your ego wants. Stay with it and trust your intuition. what is the name of the deck of cards that the first photo belongs to? i want to purchase that specific deck but cant find it.